We cleaned up the remaining caches in our 100 mile circle this afternoon. The way it's been going it won't be clean for long. We placed our 88th cache today in Leawood Park called "Leawood Jungle". Guitar Nutz and Team Six Pack were Co-FTF. 6629 Steps Today - 3.03 miles. This morning Mary dropped me off in Independence to Meet Brian and Jim. It turned out to be two vehicles and 7 cachers. 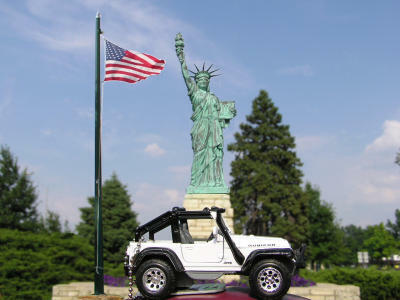 We headed down to the Lake of the Ozarks to grab a couple island caches with Brian's jet boat. The first boat ride was really ruff. I was on the front of the boat and it really beat me up. Then we couldn't find the cache. It was our only DNF for the day. We cache all day. We stopped in Warsaw for a quit bite to eat and continued caching until late. I got home just before midnight. It was a really fun day of caching with friends. 5909 Steps Today - 2.70 miles. When Mary picked me up at noon today I had no idea what we were going to do. When I got in the van she had a cache page printed out. She thought it was over around Shawnee Mission Park. It turned out to be Lake Shawnee in Topeka, Kansas. I told here if we were going that far we might as well grab the new web cam cache over at Wamego. It's about 93 miles from home. From there we headed north and east to get the new cache north of St. Joe, Missouri. We got home about 9:30 this evening. 5643 Steps Today - 2.58 miles. The Catalpa Grove cache has a new owner and a new cache. It's in a beautiful grove of catalpa trees. We enjoyed out visit. 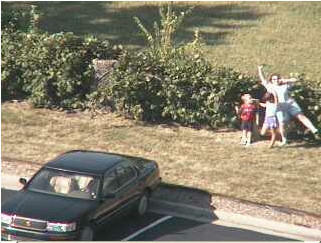 We also claimed a couple Web Cam caches in Overland Park this evening. 6333 Steps Today - 2.89 miles. This evening we went back to Olathe to grab a couple caches. Armed with an extra hint from the cache owner we were able to find the "Between a Rock and a Wet Place" cache that we failed to find a couple days ago. 5521 Steps Today - 2.52 miles. It rained all afternoon and we enjoyed a quite evening at home after a very hard day at work. It seems like the life of software developer just get harder and harder. There are so many rules and processes in place that we can't spend much time actually developing. This evening when Mary picked me up at work she had all the equipment ready to go caching. We tried for a FTF but as usual we didn't make it. Cindy with Team Samoyed beat us. 3127 Steps Today - 1.43 miles. This afternoon I walked about 2 1/2 miles down to the Little Sac River for a cache. I had to walk about 500 feet down the middle of the river to get to the cache site. I never did find the cache but the river sure did feel good. 7231 Steps Today - 3.30 miles. This morning we met Scott, Laura, Bradley, and Ashley at Silver Dollar City in time for breakfast. In order to stay out of the heat we just went from one show to another. It was a fun day. 7856 Steps Today - 3.59 miles. We try to find all caches in a 100 mile circle from my recliner. Here lately we're getting a little behind. This afternoon we found the cache that was the fartherest and still in our circle. It was a Webbycat cache in Girard, Kansas called "Round the Square". We really enjoyed it. Thanks Webbycat. 5484 Steps Today - 2.51 miles. Our 30 gallon fish aquarium was looking pretty bad. I took time to clean it this evening and replace about 85% of the water. Last night I started working at 10:30 p.m. We were doing an install for a new project. I worked all night here at home. I didn't take my headset off until about 8:00 a.m. this morning. I slept until about 2:30 this afternoon. I used the juicer to make some carrot juice and then just set the rest of the evening. There were a couple new webcam caches released this evening and Mary and I watched the webcam until Guitar Nutz posed standing on one foot and we then were able to claim both new cache sites. Then we caught this unknown cacher at the 360KC cache and was able to claim it. 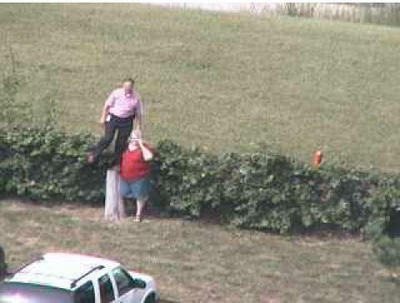 This evening we went after Kansas City's second Web Cam cache site. The requirements to claim the cache was to stand in front of the camera at the stump on one foot while someone snapped your picture. Robby snapped our picture while we posed. I decided to work on my pedometer that I took swimming in the KAW River last night. I took it apart and dried it out. After replacing the battery it worked. 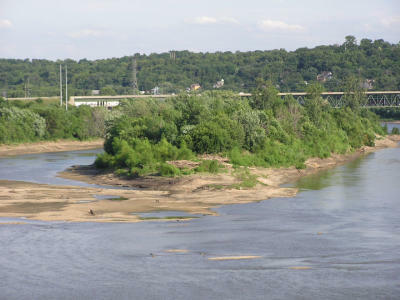 This was the day that I swam the KAW. I think this is the hardest cache that we have done to date. I wish I had gotten there a little sooner so I could have teamed up with Six Pack. I would have felt much better doing this cache with someone else. Six Pack was coming back across the river as I was headed to the island. I chose a little different route. The rapids just looked like too much for me. I think this cache is rated correctly. With the route I took maybe it ought to be a 6 for terrain. When I first stepped into the water I was met with a 2 foot gar. We scared each other and we went our separate ways. I didn't get too far until the water was up to my chest and I turned back to stash my cell phone in the bushes. This is when I discovered I had already soaked my pedometer. It's now dead. On my second attempt I realized I was going to have to swim a short distant so I put my Garmin in a zipper pocket in my swim suit. This is the biggest test I have put it to, to test it's ability to be waterproof. It survived much better than my pedometer. It passed the test with flying colors. After I arrived at the island I realized that I had not called Mary and told her I was leaving my cell phone in the bushes to keep it dry. Before I got back to it I had received 10 or 11 missed called for Mary and Brian. They were beginning to think I had drowned. The point where I cut across the island was a real jungle. I had to blaze a new trail. I know there had to be a better way. As I was leaving the cache there was a boat coming downstream. I just knew it was a cacher and I was going to thumb a ride out of there. He had trouble with his motor down below the cache site. When he got his motor running he just went on downstream. He wasn't a cacher after all. Just a fisherman. So now I had to walk to the other end of the island and swim out. The current was really swift where I crossed. I came in with one walking stick and went out with two. I went right straight through the rapids on way out. I think that was a mistake. I was sure glad I had a change of clothes waiting when I got back to the van. I was a real mess. I sure hope you guys don't make them any harder than this. I'm getting too old for this. It was quite the adventure and a lot of fun. Thanks for the adventure. This morning I logged into the local kcaprs server for the first time. We are now on the packet map. 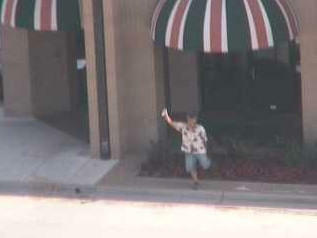 Our first cache today was Kansas City's first Web Cam. 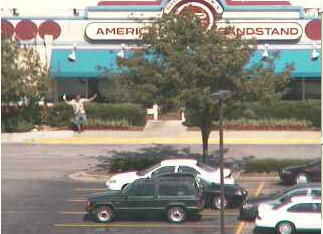 Robby grabbed our picture off the KCscout camera at I670 & Baltimore. 3384 Steps Today - 1.92 miles. This morning I got up and trimed all the trees around the patio. After the tree triming we went to IHOP with Robby. The omelets were outstanding. I spent the afternoon reading about APRS and setting up the ui-view32 program on my laptop. This is a program to plot all the packet radio stations on a map. 2035 Steps Today - .12 miles. Mary picked me up at Sprint and we enjoyed a nice lunch together at Old Chicago. This afternoon I read a lot about Ham Radio and Automatic Position Reporting System (APRS). 2035 Steps Today - 1.15 miles. This evening I worked on my entry for the White Jeep Travel Bug Contest. Here's my entry for July. 5871 Steps Today - 3.33 miles. This evening we cached around Olathe. We enjoyed our time there. I worked up quite a sweat on the "Lone Elm Campground" cache. I walked about a mile to find all 6 stages of the multi-cache. Each stage was a interesting and unique hide. After we finish caching we enjoyed an nice diner together at Ruby Tuesdays. 6326 Steps Today - 3.59 miles. We found that the guard rail where we hid KCopoly #06 was gone along with the cache. We located a new hiding place nearby and placed a new container. We found that KCopoly #21 had two containers. An old wet one and the new dry one. We removed the wet one. We were able to find one new cache in town while we were out. We also had to DNF one in Sar Ko Par Park. I forgot my pedometer and left it at home today. Today Mary received a call from the doctor and got her test results from the EMG ran last week. She has severe Carpal Tunnel Syndrome. She has to go back to the doctor whe did her knee surgery to see what he can do for her Carpal Tunnel. 3690 Steps Today - 2.09 miles. Today we went geocaching in our 100 mile circle. We finally located the cache in Protest Park down at the Plaza. The hardest cache we've done in a long time was down at Mound Lake near Mound City, Kansas. I couldn't see any other way so I waded a swamp out to a small island and then had to climb a tree to retrieve a cache. The water was smelly and I beat the water and neck high grass with a stick to scare off the snakes and critters. 3292 Steps Today - 1.87 miles. I forgot to put my pedometer on. Even if I had worn it, it would not have counted very many steps today. Tonight we went out with Robby and Alison to celebrate Mary's 58th Birthday. We enjoyed a great meal together and watched a play. 5635 Steps Today - 3.20 miles. Lately Mary's left hand has been hurting. She had an EMG done today to try to find out what's going on. 4428 Steps Today - 2.51 miles. Mary's knee doctor released her today. She does not have to go back for a year. 4807 Steps Today - 2.73 miles. This evening after diner we went after the Protest Park cache. After about an hour of searching we gave up and DNF'd it. Now we have to go back. I really don't know where else to look, but we've missed obvious caches before. 6362 Steps Today - 3.61 miles. Today was mostly just a travel day to return to Kansas City. We arrived home about 7:00 p.m. too tired to do anything. It was very nice to just sit on our couch and watch the Leawood fireworks display out our patio window. 884 Steps Today - .50 miles. Today Scott felt sorry for me and went out to help me find the caches that I could not find yesterday. Whe ended up DNF'ing the same two caches again. We just can not find them. The one I really want to find is the "Fountain of Youth" at UALR. These Little Rock cachers have whipped me today. Scott and I did 3 caches pretty quick. Then he had to go to work. I kept on caching by myself and didn't find a single cache. After the third failure I went home with my tail between my legs. 4457 Steps Today - 2.53 miles. We got kind of late start in Pittsburg this morning and the first cache was the "Cache on the Corner". 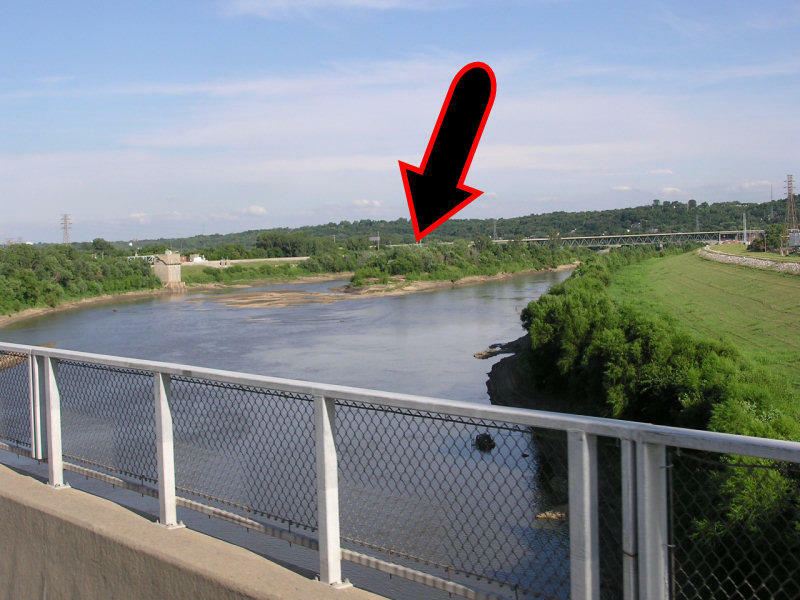 The cache is where Missouri, Kansas, & Oklahoma all meet at one spot. There is an interesting monument erected here. 4415 Steps Today - 2.50 miles.